· Spell out professional titles, such as Doctor and Reverend, and all military titles such as General and Major for names on your invitations. · Acceptable abbreviations are the nonprofessional titles of Mr., Mrs., and Ms. Don’t include academic titles, such as PhD, on the invitation unless the person is a minister with a theological degree. · No nicknames. Use full names instead (such as Michael rather than Mike). If you choose to include any middle names on the invitation, spell them out. · Spell out street names, such as Avenue, Boulevard, and Street, on all invitations. · Spell out days of the week, dates, months, times, and numbers in addresses for invitations to black tie and formal weddings. For invitations to semiformal and informal weddings, you can use numbers freely. · Give the hosts of your wedding top billing on the invitation. · Do not include gift registry information or gift suggestions on your invitations. And never handwrite anything on the invitation. · Include lodging information on a separate enclosed card with a map and directions to your ceremony and reception. You may also include this information with your save-the-date cards or on your wedding web site. · Include the dress code on your invitations to ensure your event stays as formal or as casual as you want. · If your ceremony and reception are at the same location, the wedding dress code should be printed at the bottom right or bottom center of your invitation. · If the ceremony and reception are in separate locations, your dress code should be printed on the reception card. Six to eight weeks before the wedding to give guests plenty of time to clear their schedules and make travel arrangements if they don't live in town. Save-The-Dates go out at six to eight months. Two to three weeks before your wedding date to allow enough time for you to get a final head count to the vendors and to finalize your seating chart. Your wedding website should be included on your save-the-date, or if you don't have save-the-dates, you can include the web address in the formal invitations with an insert. How can we make sure it is clear to our guests this is an Adults only event? Do we have to invite every guest with a "plus-one"? If a guest isn't married or in a serious relationship, it's perfectly acceptable to invite them solo. 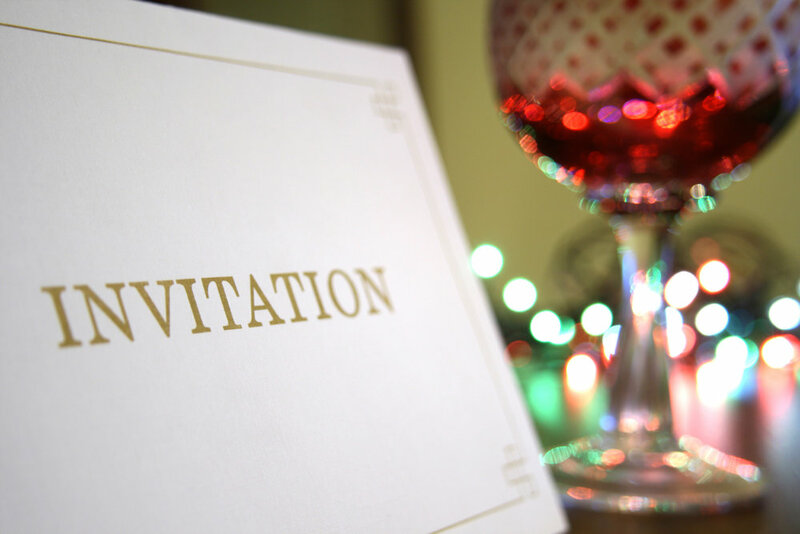 Most guests will understand that without "and Guest" or another name on the invitation means they aren't invited with a plus-one. The return address usually goes on the back flap of the envelope. Don't forget that the RSVP envelope should also be printed with this address. Don’t forget the postage! Is it okay to invite people to the ceremony only? Everyone who attends the should be invited to the wedding, but it is acceptable to invite people to the reception only. Guests not invited to the ceremony will understand it may be a private and intimate event while guests not invited to the reception may feel as if you simply don’t want to pay for their food plate or don’t care enough to have them celebrate your nuptials. I invited my friend and their partner by name to the wedding, but they recently broke up. Now they want to bring an additional person I would prefer not to come. What can I do?